Lewis Hamilton was once again fastest at the end of the session free practice session at Austin, Texas. Hamilton went out for a single lap close to the end of a session that was again heavily influenced by pouring rain. The track remained empty for the bigger first half of the 90-minute session, and it wasn't until 47 minutes into the session that Brendon Hartley stepped into his Toro Rosso and went out of the garage. He continued for several laps before being joined by the Williams and Sauber drivers. Stoffel Vandoorne joined later for a few laps as well, but it was Raikkonen who first topped Hartley. At the same time, Mercedes was so much at ease that they kicked off a Q&A session on twitter, rather than getting their cars out on track. It wasn't until 10 minutes from the end of the session that Vettel and Hulkenberg went out on intermediate tyres. The latter Renault driver ended up just 0.022s down on Gasly's earlier benchmark and signalled others it was high time for intermediates if they still wanted to have a go. 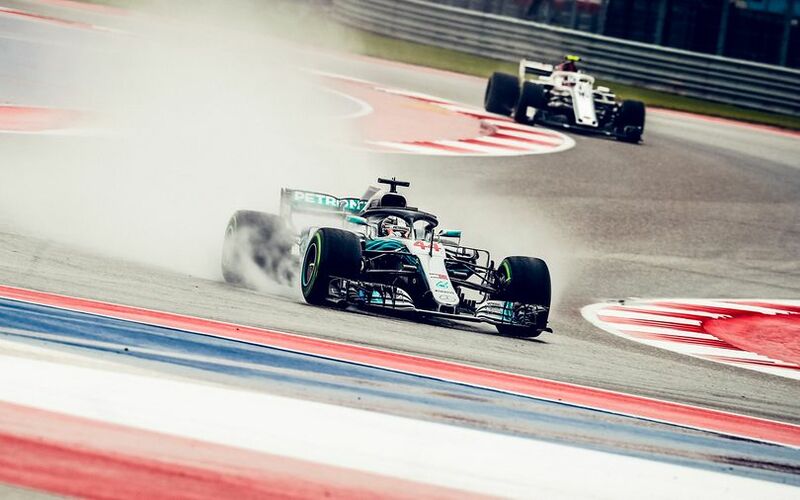 5 minutes from the end, Hamilton shot to the top of the timesheet with his first lap, before deciding to return to the pits. Nobody really came close, and 4 drivers didn't even bother coming out of the pits.